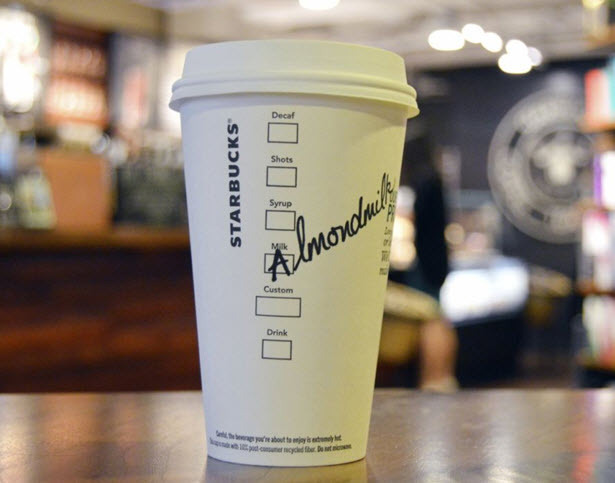 Starbucks has announced that it will offer almond milk as a non-dairy alternative starting September 6. Starbucks already offers soy milk and coconut milk as milk alternatives. The nationwide rollout of almond milk will be complete by the end of September. Yoke Wong, manager on Starbucks beverage R&D team, says in a statement, "We created our own almondmilk recipe to complement our hot, iced and Frappuccino blended beverages. It was designed so that when steamed, it creates a rich foam for hot beverages and is delicious and creamy when served in cold beverages." Starbucks says an 8-ounce serving of almond milk 3 grams of sugar, compared with 12-13 grams of naturally occurring sugar in 2 percent dairy milk. They cite data from Mintel Data that it is the most popular option available in the non-dairy market. Wong says, "The almond butter in our almondmilk adds body and complements the roasty notes of espresso. Because it's unflavored, customers can customize to their taste preferences."